More Than Making it Through the Day with your 9-12 Month Old. 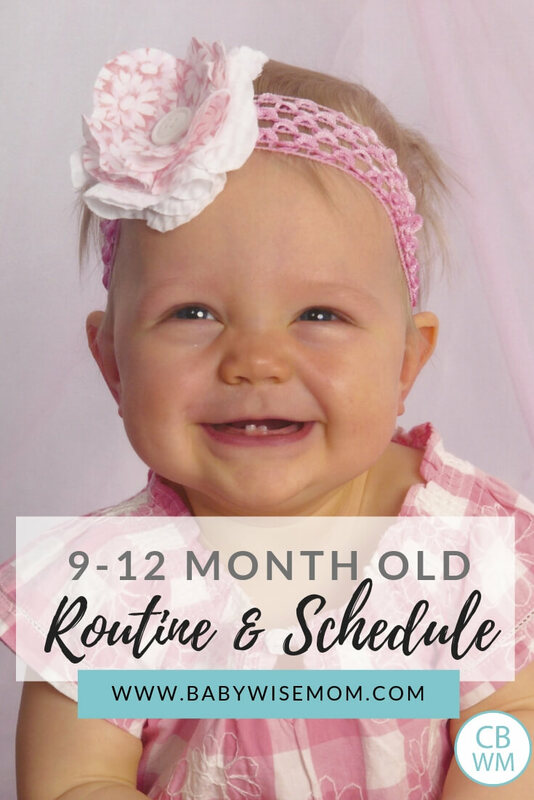 Sample schedule and routine for a 9-12 month old. Thrive rather than survive each day! Many of us get quite nostalgic during the age range of 9-12 months old. Your baby is almost a year old! Your baby is almost not a baby anymore! Your baby is almost a toddler! I think most parents start to be thinking more about character training by this point. 6-9 months might have seemed really young, but 9-12 months starts to seem more appropriate. You start to really see some need for discipline (remember that discipline does not mean to punish but to correct). Let’s go through the day for ideas on this age range. It can be a hard age range for blanket statements. Some babies start walking. Others are content to just sit in one spot, not even attempting a crawl. For this reason, there will be varying degrees for need of discipline. You have little need to correct the child who can’t move to a place she shouldn’t be. Avoid Sweets: I recommend you avoid sweets and other snacky items as long as you can. This is really easy with an only child. You can save those items for when baby is not around. Older siblings tend to expose baby to those items earlier. I know it can be fun to give these treats, and I know that grandparents often really want to feed these items to baby. The longer you wait, the better. Your baby will have more opportunity to develop a love for foods that are healthy. Avoid Salt: Your baby also doesn’t need salt and other spices on the food. Give your baby an opportunity to learn to like food as it is. You baby will have more than enough exposure to salt later in life. Generally speaking, there are few nap problems during this age range. If your child does have nap problems, please don’t now freak out. Some do. But most don’t. There can be a sleep regression around 10 months old. This does not mean it is time to drop to one nap a day. Resist the urge. Keep two naps. Watch for sleep props: If your child has a favorite toy, blanket, finger, or pacifier to sleep with, this is the age range I noticed both of my children really get a strong attachment to these security items. Before this age range, they liked the items while sleeping, but didn’t seem to give them a second thought once they were out of bed. During this age range, an emotional bond seemed to form. I recommend you don’t let your child carry the item with her everywhere. Leave the pacifier in the crib. Instruct her gently to remove her fingers when they go in her mouth. It is fine to have these in bed, but try to prevent them from becoming a difficult habit to break in the future. Third Nap: If your child hasn’t dropped the third nap yet, she will during this age range. See: Dropping Naps: A Quick Reference and Dropping the 3rd Nap (evening). Once this nap is dropped, baby’s nighttime sleep will most likely extend by 30-60 minutes–at least for a short period while she gets used to having the nap gone. Remain Consistent: Many babies seem to need less sleep, and you might be tempted to skip naps or forget to put baby down in time for a nap. Optimal waketime is still important to the baby in this age group. Also, with all of the new activities you might be introducing, you baby might get overstimulated. If you are having nap problems, be sure there is not overstimulation or too long of a waketime. Now on to the waketime activities. Safety: If your baby is moving in any way, there is a good chance you have thought about Tips for Baby-Proofing Your Home. You want to keep things safe, but you also want to provide learning opportunities. Old Classics: There are many nursery rhymes and other games you may have forgotten about. Here is a list of some of the old classics that involve movement: Peek-a-boo, Patty Cake, Itsy–bitsy Spider, This Little Piggy, Ring-a-Round the Rosies, and Pop Goes the Weasel. If you have been doing this from the beginning, or at least prior to this point, things pretty much continue as they did. See this post on Independent Playtime. Keep it up! : Keep up independent play. It is very much worth it. Be sure it is a scheduled part of each day. Free playtime should look the same as it did in the past. Free playtime can be in the presence of other family members. She can sit in her highchair and play with toys while you make dinner. Once she can sit up on her own well, you can give her a basket of toys on the floor to play with. If your child can now move on her own, remember that free playtime does not mean the child gets to wander the house looking for interesting things. If you have more than one child, you can have sibling playtime. You do not have to leave your children alone for this. What you do will depend on the age and maturity of the older child. During this age-range, Brayden was nearing three. I felt comfortable leaving them in the room together for up to five or so minutes, but I was never more than two seconds away. The two children interacted with each other a lot more during this age range, but still basically played side-by-side rather than together. Brayden did find that he could really make Kaitlyn laugh, and both really enjoyed that. Sibling playtime can be in a toy room, outside, and really you could have it be with something like a walk. See this post for more on sibling playtime: Sibling Playtime. I wrote it when Kaitlyn was 10 months old. Be sure that you have some time set aside each day for each parent to spend quality time with the baby. This can be in conjunction with other daily activities (reading, bathing, feeding solids, etc.) or it can be simply the parent playing with the baby. This is time when you are 100% baby’s. As your baby gets older, you will most likely enjoy doing things that are more playful. You can play with toys. Dad might rough-house. One note, if you have this one-on-one time be another activity, be sure you are focused on baby. If it is during feeding solids, don’t have the TV on, don’t be talking on the phone, etc. You are spending time with baby. You can start or continue play dates. Interaction during this time will be similar to those described in the sibling playtime section above. Many babies will say their first word during this period if they haven’t already. You will start to see language recognition in your child, and you will most likely be astonished as you come to realize how much she understands. See this post for more: How to Enhance Your Baby’s Language Development. Sign Language: Your child can most likely really take off with learning Sign Language. Make a goal to introduce as many words as your baby can learn. Some might be able to do one a day. Some might be able to do a few a week. Give her a chance to learn. Repeat: When your baby talks to you, respond. You can repeat what she says. Maybe she says “Yummy.” You then say, “Is that food yummy? I am so glad.” When she knows you are listening to and understanding her, it will give her more motivation to speak. If she is signing, sign and say the word back to her. Require Language Use: Once your baby has demonstrated a consistent ability to use a word, encourage her to use words. This can be either verbal or through signs. Don’t be discouraged if she mixes words up or seems to forget things she used to know. Don’t allow a tantrum to take the place of using a word she knows. See the Discipline section below for more. Label: Label everything your baby sees. Help her to know what things are called. As your baby gets older, bathtime only gets more exciting. Remember that as your child gets older, you need to be mindful of times you need to correct behavior. Bathtime can bring opportunities. Decide on what is and isn’t okay with you. Is standing in the tub going to be okay? This is the age range that Brayden started to try to stand in the tub. Decide before this happens what is allowed and what your course of action will be when it does. Assuming the weather is good enough for your baby during this time period, spend time outside. Since your baby is now much more aware of what is going on around her, this will be a much more fascinating activity. There is so much for your baby to take in. During this age range, Brayden was absolutely obsessed with going outside. It was a good activity for his expanding waketime. Physical activity is important, and the outdoors is a great place to encourage it. Walks. Walks continue to be loved by baby. There are so many new things to see. Baby will likely try to communicate to you during the walk, so pay attention so you can respond to the ‘questions’ and attempts at words. Walking to destinations is fun. You can walk to the park, the duck pond, the store, etc. Bicycle Rides: Your baby should now be strong enough to sit in a seat on your bicycle or in a bicycle trailer. This is a fun activity to add to your outside time. Park. Your child isn’t old enough to run around the playground equipment, but she might enjoy swinging or having you help her down the slide. She also might enjoy people watching. If she can move, she will try to get to things. Keep her safe and be sure you don’t let her try things beyond her physical ability. Bubbles: Your baby might enjoy watching you blow bubbles. She might even chase after them. Just Outside. You can spread a blanket out, bring some toys, and let your child sit and play. There will be much for your child to observe. If your child can move, she will like to move on her own outside. She might also enjoy passing a ball back and forth to you. Hikes. If your family enjoys this, you can go for hikes. Other. There are so many different outdoor activities you can introduce your child to. Swimming is one. Perhaps a trip to the corn maze. Maybe sledding. Baby might be able to do some artistic activities. Keep them age appropriate. This can range from possibly coloring to singing. See Baby Stuff I love: Art Time for ideas. Your need for discipline will vary on the baby. Some have basically no need yet. Others have a large need. Most likely fall somewhere in between. When Brayden was this age, I remember trying to think of what was okay with me and what wasn’t. There was a lot that didn’t bother me, but I decided to make the off-limits just so he could get the training in. With Kaitlyn, I already knew what was and wasn’t okay with me so it didn’t take much initial thought. Also, be sure to look to past and future More Than Making it Through the Day posts if your baby is at the beginning or end of this age range. Valerie,I love that you have condensed so much information into one entry! So helpful to have it all in one spot. Thanks so much for all of your hard work on this site. It’s much appreciated! Hi Val – I have to start my comments with a big THANK YOU everytime. It truly is resourceful!I didn’t know where to ask this because i’m not sure which heading this falls under, but I’m curious to know what you think about this. My esclusively bottle-fed baby is 12.5 weeks; sleeps 8 hrs after a 11:30pm DF. I know, I am going to work on dropping that DF, but not right now as I have returned back to work temporarily for 2 weeks…and momma needs her sleep! ;)My question though concerns his daytime schedule. We do a combo schedule (3-3.5 hrs). MOST of the week, he has one long 3.5 hr stretch a day(which we ALWAYS have to wake him for), but usually, he wakes up naturally at the 3 hr mark. He does GREAT with eating, waking, and napping. However, for his 8 pm feeding, he is hardly hungry. We have to basically force him to take 4 oz when he normally takes anywhere from 5-6. And then when I wake him for the DF, he scarfs down the 6 like he’s been starved or something. I’ve tried feeding him less at the 5pm feed, thinking that’ll make him hungry for his 8, but it didn’t. The same thing happened — he could BARELY finish 4 oz – it took my hubby almost an hour to feed him one night! What do you think this means? Do you think there is any correlation to his age? He’s a big boy, btw. At his 2 mo. checkup, he was already 15 lbs/ 24in long! Btw, his start/end time is 8-8, w/ a 11:30 DF. I would appreciate any thoughts on this! Thank you so much!! Hi there,Thanks so much for doing this blog, it is great!I have a question about my son’s schedule at this age. He is 10.5 months. His day has always started a little earlier and ended a little later than most Babywise babies, because my husband prefers to see him as much as he can before he leaves for work and once he gets home. For as long as I can remember, my son has woken at 6:30 and gone to bed at 8:30. I wake him at 6:30 rather than letting him sleep later.My problem is with moving him into a good schedule for an older baby. Mostly we get a little thrown off in the late afternoon. This is his current schedule:6:30-wake,bottle7:00-solids for breakfast8:30-nap until around 1010:30-bottle11:00-solids for lunch2:00-bottle them immediately downfor a nap until around 4:305:30-baby food 6:30-finger foods when we eat8:00-bottle and to bed afterwardDoes all this seem OK to you? I guess I would prefer for his afternoon nap to be more like 1:30-3:30 and then give him a bottle afterward rather than before. I feel like this way he wouldn’t need baby food at 5:30 and he could just eat all of his dinner with us at 6:30. But, I don’t know if he would go down for a nap earlier especially since he is SOOO used to getting a bottle immediately before his nap. I also don’t know if he would be able to wait until 8 or 8:30 for bed if he has been awake an hour or so longer than usual.I guess I am just wondering if this schedule seems OK based on his morning waketime. Or would it be preferable to let him sleep later in the morning? Any advice would be much appreciated! Hi, I wanted to tell you about a book I found about potty training. It’s called Diaper Free Before 3 by Dr. Jill M. Lekovic.http://www.diaperfreebefore3.com/I wanted to bring it to your attention because I think it would easily go hand-in-hand with Babywise routines. It is basically a routine based potty-training system (if that’s the right word). She recommends building “potty-time” into your baby’s routine at times like after feedings, before and after naps, etc. Not forcing the issue but more a matter of offering the opportunity. Just like now a schedule may be “first we eat lunch than it’s playtime”. Now it would be “first we eat lunch, then sit on the potty, and then it’s playtime”. She also goes into the history of potty-training and how America is one of the only countries that follows a “readiness” system and even then for no more than the last 40 years. I really think you should take a look because it seems to fit perfectly with the Babywise way of parenting. Thanks, Valerie, for this wonderful post!! 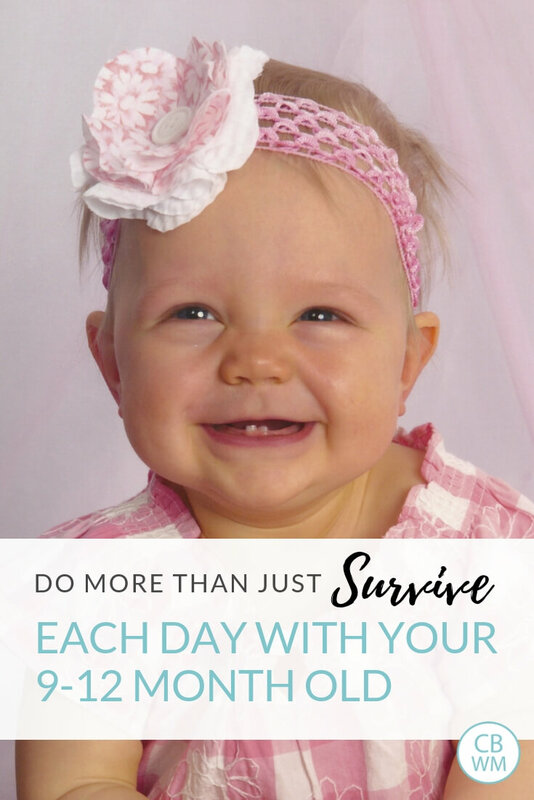 I am a mom who is trying to do more than just make it through the day with my busy almost 10 month old! I am trying to add more structure to our day so that he and I both know what to expect and it is making a world of difference! Now that the weather is getting warmer, I am also trying to take him on a walk at LEAST every other day, if not every day. One question, I really want to read to my son, but I can’t get him to sit still! He is almost walking, so he’s hard to pin down. One thing I have been trying is to put Noah beside me on the floor and instead of reading to him the traditional way, I put the book between us and we look at it together. That seems to hold his interest quite a bit longer than trying to read in my lap (until he starts scooting the book around the floor, ha:)). Did you have this with either of your kids? I want it to be a part of our bedtime routine, but haven’t had much success implementing it. Thanks also for your recent discipline post for 10 months and older! Loved it and had a talk with my husband about some things we can try now. We were spanking the hand, but I really didn’t like it at ALL, so we are going to try positive reinforcement more and probably isolation as well. I realized that he seems to get into more trouble if he has been in the same area all day long (like our family room). I think it’s because after an entire day of the same scenery, he is bored! The walks and different activities have helped tremendously. Thanks for the blog! CO Mom, Thanks so much and you are most welcome! Ann, I appreciate your thanks :)I hate to say that I don’t really know what that could mean. I don’t know if this is normal or not since I breastfeed. I do know that it seemed my kids didn’t nurse as long at that time of day. I know my milk supply was lower at that time of day. I know breastfed babies will eat different amounts at different meals, so I am sure it is fine for a bottlefed baby to do the same, though I certainly understand why you would want him taking more at that one feeding :)You might try adding one or two ounces at one or two other meals in the day to compensate for what he seems to be missing at that last meal. Osbornes,I would do the nap closer to 12:30 or 1:00. I say that since he had his nap two hours after waking in the morning. His waketime should be close for the second interval also.Personally, I would ask DH if he prefers more time before work or after work. I think it is great that he wants to see him, but I think it would be better to let him get some extra sleep in the morning. So you could let him sleep until 7 AM. Then his lunch time would be closer to lunch time and he could also most likely make it until your dinner time. If you do have it so he takes the earlier nap, you can just give him a bottle as soon as he wakes rather than as right before he goes down. Then he can wait until dinner with you for more food. You could feed him his solids right before you eat so you can eat and he can eat his finger foods. Thanks Lauriella, I will look into that. It sounds interesting. Greenfields,Brayden was a busy boy, so when he was younger and we would read, he wouldn’t last long. I remember one time when my sister was reading a book to him and he would try to turn the page before she was done and she wouldn’t let him. He sat through the book, which floored me. So part of it is expectations.Another part is that you don’t necessarily have to read what the book says right now. You can do your own story. Brayden was very interested in having you point to everything and tell him what it was. If there were animals, I would tell him what it was and what sound it made. So don’t be affraid to change the story up to be more in line with his interests. Until he is able to sit through a book, you can do story time at a different time of day so it doesn’t get him all wound up before bed.You are welcome about the discipline post. I am glad it could help! my baby turned 9months on march 25th and since then has been going through some kind of regression! she’s extra clingy, can get cranky sometimes but the hardest thing of all is that she now cries going down for naps and night sleep. she never used to do this, has been sleep trained since she was 3.5months. she is totally fighting her naps and night sleep. i am remaining consistent with our schedule (we are napping by the clock), she’s down to 2 naps/day. she has also been waking early but she’s hit her developmental milestones quite early and have mastered them since she was just over 8months (crawling, standing, cruising and getting down from standing position) so i’m not sure why she’s now crying! she never used to do that. have you ever heard of the 9month regression? it’s so hard to hear her crying because she never used to! her teething doesn’t seem to bother her because she’s happy and smiling all day but as soon as the lights go out for naps and night sleep, she cries and then wakes up and cries. any suggestions/advice? Kathy,There are a couple of things I would consider. First is be sure everything is consistent in life. If you have moved, started something new, etc. she might be feeling disrupted. If all things are the same, there are a couple of other things. One is she might need a bit longer of a waketime length. Another is it could be separation anxiety. I don’t have experience with separation anxiety. See the blog label “separation anxiety” for all thoughts on it, but also look into other resources for information. If this the problem, one thing to do if you aren’t is independent playtime. First, Thank you so much for your blog. It is an invaluable resource and I consult it on a regular basis. 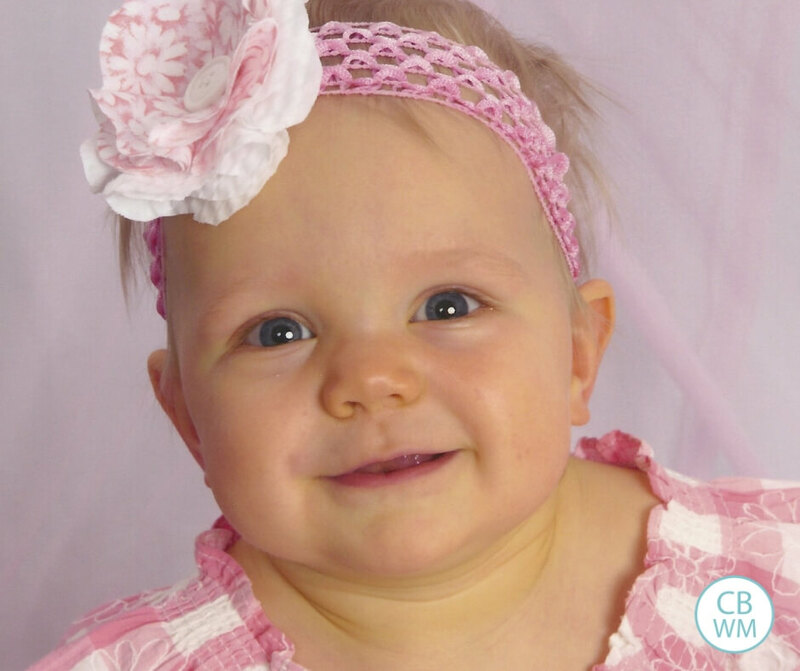 My baby is almost 8 months old and we have followed babywise from the beginning and have been very happy with her schedule, which currently is: 7 (bottle/cereal/fruit); 9 nap for 1-1.5 hours; 11 (bottle/veggie/fruit); 1 nap (1.5-2 hours); 3 (bottle/veggie/protein or cereal/fruit); 7 (bottle and bedtime routine). This schedule is working well but or course I'm already thinking ahead to the next change, which I foresee as moving to 3 meals per day, likely sometime between 9-12 months. I've noticed she seems less hungry at the 11 am feeding which may be the first sign that stretching things out longer may make sense in the next several months. Based on what I've read and discussed with pediatrician, I am thinking of the following schedule but would appreciate your comments/suggestions: 7 (breakfast – bottle/cereal/fruit); 9:30 nap; snack?? (does she need one, say around 11ish? ); 12:30 (lunch — bottle/veggie/fruit); 2 nap; snack?? – say around 3:30ish/does she need one?? ; 5:30ish (dinner — veggie/protein/fruit). Questions that occur to me are whether these are the right times for this type of schedule? does she need snacks with the three meals and if so when? If "dinner" is as early as 5:30 will she be able to go until 7 the next morning without getting too hungry? My husband and I currently have dinner about 7:30-45ish after she goes down so I don't see us eating with her at 5:30, but we do always eat breakfast together since that is when the "meals" tend to align best. I currently like doing a 7 pm bottle but really like the idea of doing 3 meals and am trying to find the right times. I'd really appreciate any advice you may have. Thanks again!! IAB, typically, you will have one snack a day unless you are down to one nap a day. I definitely would not do a snack at 11 if she already isn't very hungry for lunch at that time…then she will be less hungry for lunch. I would, instead, do lunch at 11:30 or 12:00 at the latest.My kids basically don't have snacks until they go to one nap because we eat an early dinner. Most people seem to do snacks after the one nap to help the child make it to dinner. But we eat around 5/5:30, so my kids can make it just fine. They do, however, have a snack between breakfast and lunch. McKenna is 9 months and does not have a snack at all. She still eats 4 times a day.I really feel best about four liquid feedings and breakfast, lunch, and dinner in all babies under 12 months. I just think that way we are sure to get all the liquid in them they need. I do have a post titled "dropping the fourth feeding" that will give you more guidance on this. Good luck!